Annegret Oehme is an Assistant Professor in the Department of Germanics at University of Washington, Seattle. 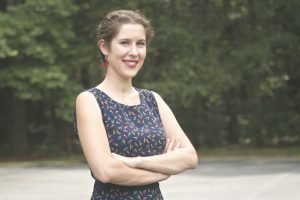 She received her PhD in 2016 in German from Duke and University of North Carolina at Chapel Hill (Carolina-Duke Graduate Program in German Studies). She holds a B.A. in Jewish Studies and an M.A. in Medieval and Early Modern German Literature and Language from Freie Universität in Berlin. Her dissertation researched the adaptations and transformations of Wigalois, a text describing the adventures of an Arthurian knight, across different languages (Yiddish and German) as well as across different media (manuscripts, prints, wall paintings, comics) from the 13th to the 21st centuries. Her research interests include medieval and early modern German and Yiddish literature and cultural transfers within a German-Jewish context. Annegret Oehme, “Schweigen ist Silber, Reden ist Gold. Über die Bedeutung von Reflexion und Kommunikation in der jiddischen Magelone Adaptation,” in Aschkenas 25/1 (2015): 83-96. Annegret Oehme, “Spinoza in Love. Reflections, Affect, and Subjectivity in the Yiddish Magelene Adaptation,” in DAPHNIS & CHLOE 43 (2015/43): 54-72. Annegret Oehme, “’es wil mein namen nirgez nenen.’ Identitätskonstruktionen in der jiddischen Paris un Viene Adaption,” in Hybridität und Spiel. Ed. by Martin Baisch and Jutta Eming, Berlin: Akademie Verlag, 2013. 339-355. “Wellichs du tuſt, das wirt dich reuen. Strategien der Wissensvermittlung in Albrechts von Eyb ‘Ehebüchlein’” in Wissen und Geltung. Ed. by Benjamin Hübbe et.al. Berlin: Vandenhoeck & Ruprecht.